Paying bills. For most of our marriage, those two words struck dread in my heart. It always seemed that there wasn't enough money to cover our expenses, and I was always juggling things just to pay the minimum on our many charge accounts and loans. We made the decision early on that Terry would work, and I would stay home to be the mother and housekeeper, which is just what I wanted to do. However, I guess we didn't curtail our spending to match the reduction in income. I managed the bills, and when Terry wanted to buy something, I didn't argue about it. Whenever I said we couldn't afford something, he would fret and worry and moan about not making enough money to support his family, and it was not something I enjoyed hearing, so I just sucked it up and did the worrying myself. Of course, I was not blameless in all this. I loved buying stuff for the kids, and the store credit cards would build up. Terry remained blissfully unaware of our finances most of the time, but once in a while, he would figure out that we were spending more than we were making, and he would get the brilliant idea to consolidate all our credit card payments and then not use the cards. Great idea! The problem was that we continued to use the cards, and then we had not only credit card payments, but a consolidation payment, too! I spent many a sleepless night worrying about how we were going to pay all of our bills, but I found that somehow, just when we needed it most, we got some unexpected income and things were fine. Finally, I started working when Doug was 4, and things eased up a little. I was only working part time, so we still had lots of bills. And we were remodeling our very old house almost all the time. We did this on the cheap, and now you can tell it, but it still cost money we really didn't have to spend. Things didn't seem to get a whole lot better until the 90's, when I started teaching full-time again. We finally had breathing room, but even then, we had teenagers and their expenses to cover. As you know, I like to paint. However, I only get around to it when the muse strikes, so to speak. And it doesn't seem to strike very often. You have to be in the mood to do a good job when painting a picture, or nothing looks right. At least, that's the way it seems to me. At home, I don't seem to be in the mood very often. Although I have a very nice room in which to do my thing, at the moment it's pretty cluttered, and truth be told, it seems to get that way really fast when I do clean up the scattered papers and stuff lying around. Consequently, there isn't too much room to spread out and get down and dirty, so to speak. 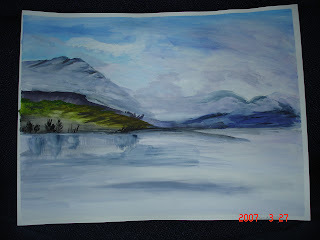 The last several months, I have been attending water color and acrylic painting classes that are given free at the local library. These have been fun and inspirational, but they have been sporadically offered. Fortunately, they are going to be offered monthly, and that is good. But something even better has come along. Terry saw a small article in the local paper a few weeks ago saying that the newly renovated main library in Shepherdsville was going to open its meeting room once a week for anyone to bring their own supplies and create art. This meeting time is Monday afternoon. I have gathered up my stuff and headed to the library the past two Mondays, and here you see the results of my labors. The two-hour time period is just about enough to complete one picture for me. I tend to be a one-sitting painter and not go back to the work once I've left it. The bottom one is a water color that I copied from an instruction book, with my own variations. 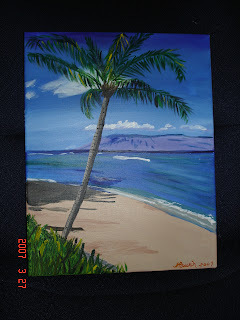 The top one is an acrylic of the ubiquitous beach scene, this one being at Maui. It is very nice to go and sit with a bunch of like-minded people and create. It stirs the muse, I guess. Of course, most of the other women there are actual professional artists who belong to art guilds and display and sell their work, but there is another rank amateur along with me. We just mainly sit there and do our thing while we listen to the other ladies talk about the shows they've been to and the work they have sold. They all take a lot longer to finish a painting than I do, which makes me wonder if I am not doing something right, but I keep on. Meanwhile, I am glad to have this opportunity available each week that I can carve out the time to go. It feeds the muse...Life is good! A - Available/Single? Married, 37 years. J - January or February? If I must choose, February. It's short and closer to spring. T - Tag Three People: Don't know three people who have not already been tagged. U - Unknown Fact About Me? I think I'm an open book. I was a spelling bee champ, but I don't think that's unknown. Tomorrow is my mom's 83rd birthday. Unfortunately, this is the 11th birthday that she has not spent with us. She died two days before her 73rd birthday of metastisized breast cancer. It seems like 10 years would be a long time, but it really doesn't feel like it. It is still fresh enough in my memory to bring tears to my eyes, but maybe that's because my mom was such a special person, and I still miss her a lot, as I believe most of her family probably does, too. Mom was a child of the Great Depression, born to a mother who had immigrated from Germany as a child and a father who was also of German descent. Her family was poor, and both parents worked, so my mom was a main caregiver for her little brother. She had a lot of responsibility as a child, but she handled it well, and she enjoyed life. She was a good student and popular girl in high school, where she met my dad. 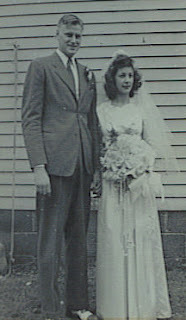 After graduating, she worked as a bookkeeper for a year until she and my dad got married on June 10, 1943. She quit her job to be a homemaker while my dad worked at GE. However, this was wartime, and before long, my dad was in the Navy, leaving his young, pregnant wife in the care of his parents. By the time she was married a year, Mom was living in a small place with a baby son and in-laws. My grandmother was nice, but she was a very dominant personality and tended to be critical of mom's abilities as a mother. But mom persevered and kept her sense of humor for the next few years until my dad returned from the war in January, 1946. They moved to their own place, and Dad returned to GE. My brother, Bob, was born in 1944, during World War II, as I said, and I was born in 1948. My sister, Peggy, followed in 1952. Things were going well, and my parents had bought their first house, and then Dad was transferred from Erie, PA, to Louisville, KY, in 1953, and we all moved. It was a big transition for mom, who knew nobody in this area and couldn't drive. You can bet that she learned to drive pretty quick, and that she made friends even faster. She was the kind of person who attracted friends because she was happy and she was a sympathetic listener. 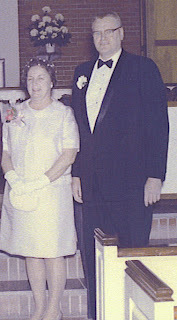 Once settled in KY, Mom was the quintessential 50's wife and mother. She kept a clean house, cooked nutritious and tasty meals, and generally lived to serve her family. She didn't wear pearls and heels around the house like Harriet Nelson or June Cleaver, but she did usually wear a dress of some sort. And every day, without fail, before it was time for my dad to come home from work, she freshened up and put on lipstick and met my dad at the door with a kiss. She saw him off to work in the morning, too, but sans the lipstick. As I grew up and got married, my mom shifted roles subtly from authority figure to confidante and friend. She was fun to shop with and talk to, and this was a side that seemed to be new to me. She was a tremendous help when my kids were born and gave calm advice when I was frazzled, which of course was often. All of her grandchildren thought she was cool, and she willingly and patiently played games with them and entertained them. My parents were wonderful babysitters, although I didn't ask them too frequently so they didn't get tired of it. However, Terry and I were able to take several trips and leave the kids with my parents with complete confidence. Of course, time passed, and my kids grew up, too, and then it was usually Mom and Peg and I who took the shopping and lunch trips. 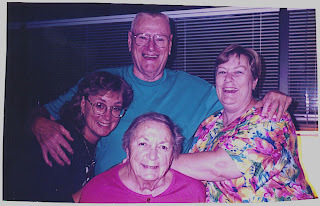 We always had fun, often at Mom's expense, as she danced down the aisles of stores and sang along with the Muzak. Even once she was sick, she would get in one of those little motorized carts and drive all over the store, often backing into displays along the way. In July, 1989, Mom discovered that she had breast cancer. She had a single mastectomy, and the lymph nodes were clear, so the doctors declared her cured and sent her on her way. Little did anyone know that the cancer was already making inroads into her spine. It was two years before she began to feel it, and another year after that until she finally went to the doctor to find out what the problem was. By that time, it was firmly entrenched, and she had what the oncologist called "hot spots" in several places of her frame. They got the worst of it under control with radiation and chemotherapy, and Mom did well for several years. However, in 1995, she developed colon cancer, which they got right away, but had scar tissue, which required another surgery. At this point, the surgeries had taken a lot out of her, and by September of 1996, her bones were getting pretty fragile. She fell and broke her hip, and the cancer had a field day, finally claiming her on March 14, 1997. During all these travails, she never gave up hoping and fighting to stay well. She rarely complained and took every setback in stride, always working to maintain her health and her dignity. She wanted very much to live and see her grandchildren grow up. Copnsequently, I believe she went to her grave believing she would get past the latest setback and move on. She did, just not in the way she expected. Mom was a very special person. She enjoyed life and laughed often. She had great fortitude. She liked music, reading, traveling, and painting. She was very artistic, and she encouraged all of us kids to develop our talents, too. She was my biggest muse and cheerleader in everything I endeavored. She was just a genuinely nice person. That seems like a trite word, but it wasn't in her case. She was a kind and generous and a friend to all. She was my biggest role model. My greatest ambition is to be the kind of person she was. I wish my children's spouses and my grandchildren could have known her. Happy Birthday, Mom. A simple compliment. But it made my day today. When you have been married as long as Terry and I have, you tend to get into a comfortable routine and sometimes take each other for granted. We tell each other that we look nice when we dress up, or compliment some work or project the other one has done, but we tend to take each other's innate qualities for granted after all these years. You are looking at the only pet we have at the moment, a tomcat named Spot. You can't see it very well, but he has a white spot in the middle of his back, hence the name. You will notice by the picture that Spot is inside the house. This is not the way it is supposed to be, or the way it usually is. However, Spot sneaks in every chance he gets. It's like a game for him, to see if he can make it in the door. It's really easy when we have company, as we did today, but I make it a challenge because I don't want to keep him in the house or have him get used to the cushy surroundings. I keep a ladybug flyswatter by the door that he doesn't even like to look at, and he stays away. I guess that sounds mean, but Spot has always been just what the name says, a tomcat. He was born to a mother cat that lingered around here longer than most manage to several years ago. I don't even know how long, but it has to be six or more years ago. He hung around here, but he was pretty standoffish. After a few years, he just disappeared, as cats in the country are wont to do. We have cats that wander away or get hit by cars or attacked by unfriendly critters or just die of natural causes, but few last longer than 2 or 3 years. So when Spot disappeared, we just took it in stride, and another cat came along to fill his space. This was a black and white cat who had a friendly disposition. 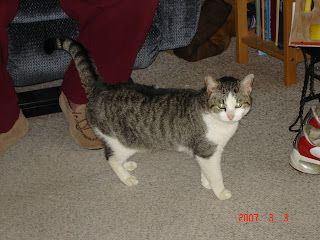 He was our main male cat for a few years, and then he just disappeared, as Spot had. Meanwhile, all our other cats, male and female, had gone off, too. We were catless for the first time in probably 20 years. As luck would have it, the very next day, Spot magically reappeared. He must have been living with someone else or something, but here he came, just like he owned the place, and set up housekeeping. We think that maybe he chased the other, gentler cat away. This was about 3 years ago. At first, he was distinctly unfriendly to everyone and kept his distance from all people. I put food out for him, and he deigned to eat it, but he wouldn't respond to any other overtures. Gradually, I won him over, and now he sees himself as MY cat. He will tolerate the touch of others when he is in the mood, but he is, like I said, MY cat. When I am outside, he follows my every step and makes sure he gets petted and fussed over. He would sit in my lap, but his claws are so sharp that I can't let him because he starts kneading me with them! He rides in the golf cart to the mailbox and back every day, in spite of his natural dislike for being in moving objects. He just tucks himself up next to me and hunkers down for the ride. So, you see, Spot is meant to be an outside cat. I have had inside cats that always, after a few years, started avoiding the litter box and having allergy problems, so it is best he stay outside. Also, those claws would be very destructive to my furniture. Sometimes he comes in and hangs out for a while, but he lives outside, and he knows it. I think he just likes to prove that he can get the best of me and get inside! He's the best kind of pet for me, a person who doesn't seem to have a natural affinity for animals. I like them okay, but usually I can do without them fine, too. Spot and I are alike, I guess. He likes people okay, but he can live without us just fine, too! I hope he stays around a long time this time.